In today's increasingly mobile society, public safety faces challenges when responding to emergency calls for service – everything from determining the location of the incident to effectively communicating with children or disabled or confused callers. To enhance delivery of emergency services to the public, Washington, D.C.'s Office of Unified Communications (OUC) implemented Smart911. When OUC began to investigate its options for allowing the public to share additional information with 911 and emergency responders, its greatest concerns were the freshness of the data and the efficiency of integrating it into 911 calls. Furthermore, it was seeking a solution that would not only handle the collection and management of resident-provided information, but also that could automatically deliver the information provided by tourists and other visitors to the 911 center. 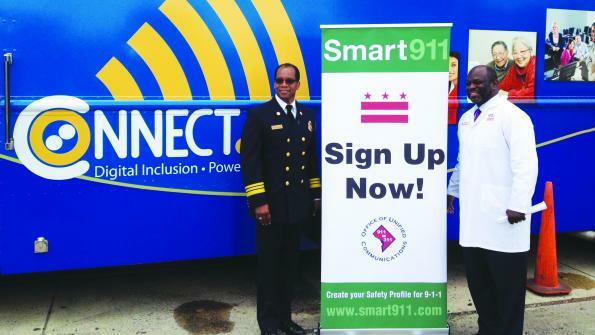 "Smart911 provides an easy and secure way for Washington, D.C.'s residents, commuters and visitors to share the information they feel is important for emergency responders to be aware of before they are in the midst of a stressful and potentially life-threatening emergency," says Jennifer Greene, director of OUC. Smart911, which is now deployed in 911 centers across parts of 26 states, provides a simple and scalable way to manage the data residents enter into the system. Registered users create a free Smart911 Safety Profile online and are automatically prompted to update their information twice a year. In addition, all telephone numbers attached to a Safety Profile are confirmed by an automated call process to verify the owner. Information is stored in a secure national database that is made available to public safety only when a 911 call is made and will display in any 911 center where Smart911 has been deployed nationwide. OUC deployed Smart911 in July 2012 and has been marketing the free service to the public through various channels, including city bus ad campaigns, e-mail communication and local media. It also has a partnership with the Connect.DC Mobile Technology Lab, which has been appearing in neighborhoods offering free internet access to allow residents to create their Safety Profile on site with assistance from OUC staff.